When you think about rainbows its more than often regarding how beautiful they are, the myths, legends and poetry they inspire and the elusive pot o’ gold and mischievous Leprechaun waiting at their end. Aristotle thought about rainbows alot, and came to the conclusion that they were caused by reflection of the sun's rays by the rain. Since then physicists have found that it is not reflection, but refraction by the raindrops which causes the rainbows. Refraction is simply the bending of any type of wave, be it a sound wave, radio wave, or in the case of rainbows, a ray of light. When the sunlight strikes raindrops in the air it is refracted. The raindrops act as a prism and the refracted rays of light form a rainbow. Ever seen the cover of Pink Floyd's "Dark Side of the Moon"? That is an example of refraction, a ray of light passing through a prism, a three dimensional transparent object. A rainbow forms when these colourful rays of light take the shape of a beautiful round arch. The rainbow is the result of white light being refracted or bent into many beautiful colors. Basically what happens is that as a ray of sunlight enters a raindrop it is bent or refracted, the raindrop acts as a prism. This causes the initial white ray to split into its many different colors. When this happens with millions of raindrops the result is a beautiful rainbow! If you didn't know, the colours are Red, Orange, Yellow, Green, Blue, Indigo and Violet in that order. An easy way to remember this about rainbows is to use the saying my teacher taught me, Richard Of York Gave Battle In Vain! The difference in the size of the rainbow depends considerably upon the size of the raindrops that the light passes through. The width of the colored band increases as the size of the drops increases. Sometimes we see two rainbows at once, what causes this? The ray of sunlight enters the raindrop and is refracted on the inside. But not all of the energy of that ray escapes the raindrop after it is refracted once. A part of the ray is refracted (or bent) again and travels along the inside of the drop to emerge from a different point on the drops exterior. 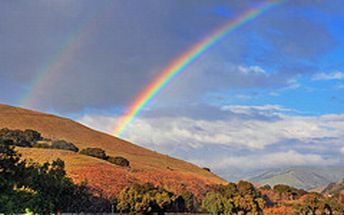 The rainbow we normally see is called the primary rainbow and is produced by one internal refraction; the secondary rainbow arises from two internal refractions as the rays exit the drop. Lunar rainbows are formed when the moon's light refracts through drops of rain. Make Your Science Project About Rainbows!